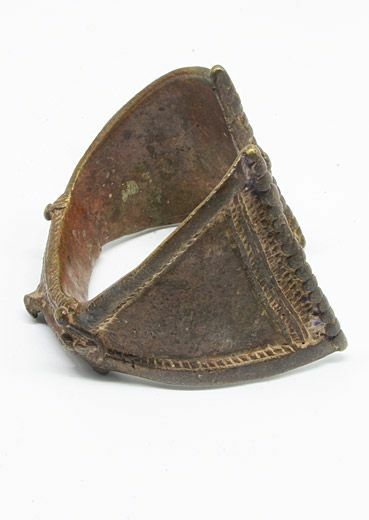 Open bracelet from the Fra Fra (Gurunsi) in Ghana. A single bracelet was always worn on the left wrist and not on the right as brass is "poisonous", and a person eats with his right hand. Brass ornaments are closely connected with religious beliefs. When a young child is named, a soothsayer will inform the parent that the child is to be under the protection of one of the ancestral spirits. The soothsayer then prescribes a particular article, such as bracelet, anklet or pendant, which the child should wear throughout its life. This maybe changed for a larger and heavier one as the child grows to adulthood.